(Phys.org) —The excavation at Ipplepen, run by the University of Exeter, is back on site following the discovery of a complex series of archaeological features thought to be part of the largest Romano-British settlement in Devon outside of Exeter. Wheel ruts found in the newly excavated road surface are thought to be like those at Pompeii caused by carts being driven over them. 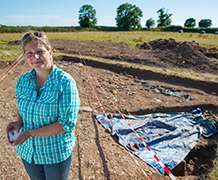 This is cause for excitement according to archaeologist Danielle Wootton, the Devon Finds Liaison Officer for the Portable Antiquities Scheme. She said:"The road must have been extensively used, it's intriguing to think what the horse-drawn carts may have been carrying and who was driving them. This is a fantastic opportunity to see a 'snap shot' of life 2000 years ago." The geophysical survey and a significant number of Roman coins found when the site was first discovered highlighted the importance of this extensive site and its potential to explore the relationship between the Romans and Devon's native population. This year's dig, directed by Dr Imogen Wood has uncovered a few more Roman coins, two of which date from between AD 43 to AD 260 and around six late Roman 4th century coins. One can be accurately dated to AD 335 - 341. However, the location of personal artefacts, such as the newly discovered Roman hair pin , brooch and bracelet are equally as thrilling for the archaeological team. The pin would have been used to hold the hair together much in the same way similar items are used today. Danielle Wootton said:"Roman women had some very elaborate hairstyles which changed through time like our fashions do today. Hairpins were used to hold complex hairstyles like buns and plaits together and suggests that Devon women may have been adopting fashions from Rome. This period in history often gets flooded with stories about Roman soldiers and centurions; this is interesting as they are artefacts worn by women." Green and blue glass beads have been unearthed, which suggests that colourful necklaces were also worn. Two amber beads have been discovered which are likely to have travelled many miles possibly from the Baltic coast to their final location at Ipplepen in the South Devon. Wootton explained:"During the Roman period amber was thought to have magical, protective and healing properties. These very personal items worn by the women that lived on this site centuries ago have enabled us to get a glimpse into the lives of people living everyday lives on the edges of the Roman Empire." Pottery has also been discovered by the Archaeology Department's students and local volunteers on the excavation. Dr Imogen Wood, University of Exeter said:"The pottery recovered suggests people were making copies of popular roman pottery for cooking and eating, but also importing a small amount of fine pottery from the continent such as drinking cups and Samian bowls for dinner guests to see and envy." The excavation is being carried out until the end of July and is likely to reveal further exciting finds which will help to further our understanding between Roman Britain and its native population. An Open Day for members of the public to view the Ipplepen dig and its Roman Road is on Sunday 20 July between 10am and 4pm. Directions to the dig, involves going to The Hub information point at Ipplepen Methodist Church, Ipplepen, TQ12 5SU between 10am - 4pm. There will be displays at the Hub and the opportunity to talk to people taking part in the dig. From the Hub, visitors will be directed to the excavation where official tours of the site will take place throughout the day. There will be children's art making activities with local artist Joe Webster and the opportunity to meet some 'real- life' Roman re-enactors to on the day. The archaeology information point at the Hub will continue to be open on Mondays- Fridays from 10am - 4.30 until the 31st July. University of Exeter archaeologist, Dr Ioana Oltean said:"This season's excavations are proving to be a real success. We are beginning to demonstrate the importance of this site in the Roman period when the road going through the settlement connected Ipplepen with the Roman world and brought here not only coins, but also pottery and personal goods used in everyday life."